Titan Poker is a large online poker room, but unfortunately it does not accept U.S. based players. If you are an American online poker player, please check our other offers such as Carbon Poker. With Black Friday depriving network giants Full Tilt and PokerStars of their US customers, Titan Poker can stake a powerful claim to be one of the world's leading websites. Founded in 2005 and residing on the iPoker network, Titan boasts an impressive 10,000 ring-game players and 55,000 tournament players at peak hours. Over the past year, Titan has expanded its website to include a sportsbook and live casino, providing a greater feeling of community. This move, coupled with the fact major bookies William Hill and Bet365 also reside on the iPoker network, means an influx of punters and gamblers to make the ring games even juicier. Titan provides a huge 200% up to $2,000 first deposit bonus, and claims to offer the fastest bonus redemption rate in the industry. So if you deposit the full $1,000, you could release $2,000 in less than two months. On top of this, Titan gives new players four tokens to their $2,500 New Depositors Freerolls, which are great for aspiring bankroll builders and give players a chance to win gadgets such as an iPad touch. Titan offers a comprehensive, six-tiered VIP structure, where benefits include entry to weekly freerolls and the chance to cash in your VIP points for real money. Accumulate 7,000,000 and you could pocket yourself a handsome $120k! 17 points are awarded per $1 of rake. When you register for the first time at Titan Poker, use the bonus code BIGONE, so you can receive your exclusive first deposit bonus of 200% match up to $2000. This bonus is only available if this is the first time you register at Titan Poker. The bonus code must be entered when you register (click "Create Account"), as shown in the picture below. Titan boasts a range of other promotions, the most innovate being the progressive jackpot tournaments. The ���Dirty Dozen' involves two-table, twelve player, $2 + $0.40 SnG's, and if you win four in a row you scoop the $2,000 jackpot. The real carrot is the $25,000 Rio jackpot, where players have to win six, six-player $20 + $3.50 SnG's to rake in the prize. Other promotions include ���Go Vegas!' where players compete for a $13k WSOP Main Event package, SnG ���summer heat' leaderboards and ���MT3' where the top 20 MT3 players on the overall leaderboard each win luxury $5k Las Vegas experience packages. There is a plethora of action at low and mid-stakes action on Titan, so much so it can sometimes be tricky to find a table. Titan offers a range of variants, including NL Hold'em, PLO, Razz, 7-Card Stud and 5-Card Stud. The Scandinavian presence along with the likes of British hotshot Sam Trickett mean there are high stakes games, although play above $10/$20 is usually restricted to heads-up. Nosebleed stakes phenomenon Viktor ���Isildur1' Blom, who now represents PokerStars, was credited with building his bankroll on the iPoker network. His hyper-aggressive style was too much for the passive contingent of players and he soared through the stakes under his alias ���blom90'. Titan adopts the industry standard 5% rake, with a cap of $3 at higher levels. Since the loyalty schemes and bonuses are based on Titan VIP points, and points are given on dealt rake, this attracts some nitty short stackers, which can harm the integrity of games. It is possible to find a NL50 game filled with short-stackers, but thankfully there are tables where players need to sit with a minimum of 50 big blinds. Titan Poker is also great for tournaments, with the flagship event being the $200 + $15, $200k guaranteed. There are numerous satellites to live events, including the WSOP, Irish Winter Festival and Asian Poker Tour. Titan Poker is one of the largest European poker rooms with plenty of traffic and attractive promotions, and in particular they have a wide range of tournaments. Titan Poker is the creator and host of the ECOOP (European Championship Of Online Poker) with its $4.55 million in guaranteed prizes. This prestigious event takes place every year in the spring during a two weeks period including Holdem, Omaha and 7-Card Stud tournaments. On a daily basis, Titan Poker has a rich schedule of regular tournaments. There are between 5 and 10 starting every hour, with buy-ins as low as $1.1 up to $320, with plenty to choose from in the $5 to $33 buy-in range. Players can choose from a wide selection of tournament options, including Freezeout, Addon/Rebuy, Sit'n'Go, Heads up, while game variations range from Texas Hold'em, Omaha and Omaha HiLo, to 5 Card Stud and 7 Card Stud. 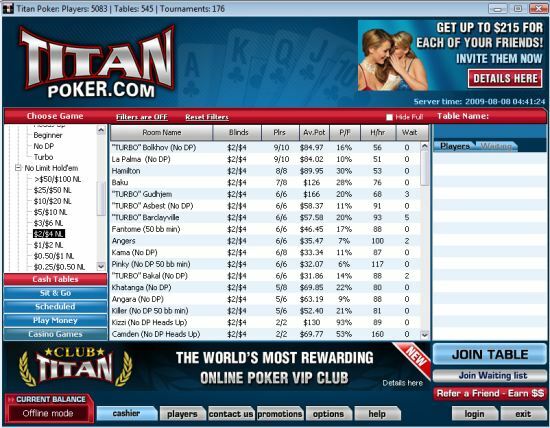 Titan Poker runs on the Playtech industry leading software. This is a very robust software used by millions of online poker players, including players at some other rooms on the ipoker network. Titan Poker provides functional albeit unspectacular software. In game graphics are crisp and have a cartoony feel, and in PokerStars-esque fashion players can select their own avatars. There is a useful ���last-hand' tool in the top left, but it isn't quite as snazzy as the PokerStars or Full Tilt virtual hand re-player. Titan is fully compatible with tracking software such as Hold'em Manager, and supports 16-table play for a seamless multi-tabling experience. Titan's introduction of multi-currency play was refreshing, and the lobby contains perks such as a My Buddy feature to help track the fish and a ���My Tournaments' tab to check which tournaments you have registered for. Some innovative features are player to player chat, and full screen or mini-view mode for easier multi-table simultaneous play. You can choose to install Titan in your own language such as French, Spanish and many more. You can also use local currencies, not just US dollar. Titan sets the benchmark in terms of customer service, with agents on hand 24/7 to answer your queries in live chat. Because Titan Poker has closed to U.S. playersfor a long time, the competition is less difficult to beat than at the major U.S. poker rooms. Many people are still discovering online poker in Europe, offering good opportunities to make money off them as they are learning the game. Added to the fact that Titan Poker operates on the ipoker Network, one of the world largest networks with great traffic, it means that a lot of opportunities to make money will present themselves at Titan Poker while you are grinding your bonus, and after. Even more so with the afflux of the gamblers coming from the casino of sports betting sides of the network. In addition to the bonus, TitanPoker offers a comprehensive reward system. It has six VIP levels: Bronze, Silver, Gold, Platinum, Titanium, and Diamond. Every player begins at the Bronze level, earning points both at ring games and tournaments. You move up in level by reaching the following milestones: 1600 points for silver, 7000 points for gold, 11000 for platinum, 18000 for titanium and 40000 for diamond. The higher you are in the VIP system, the faster you can earn special rewards and gifts possibly worth a lot of money. Overall, Titan Poker is Europe's premier poker room. Its untarnished reputation, high volume of ring game players and extensive VIP system mean it is a superb place to play poker. Do not forget to use the titan bonus code BIGONE when you sign-up. This entitles you to get an exclusive 200% bonus up to $2,000, only if you have never played before at Titan Poker. Titan Poker offers this large bonus to welcome you. If you make the optimal deposit of $1000, your account will be credited with a matching $2000 in bonus. To convert this bonus into real cash, simply play real money hands. The bonus will progressively become real cash that you can then withdraw to your bank account.